In concert with the Mar Vista Community Council, Windward offered four pilot weeks of a new workshop, Windward Teaches Tech, this spring, where local older adults (many of whom attend MVCC meetings right here on campus) could learn tech and smartphone skills, as well as learn how to use, or get better acquainted with, apps such as Netflix, Nextdoor, Lyft, Uber, and Hulu. The program was started based on a conversation at the Aging In Place Committee back in November 2016. The members of the Aging In Place Committee expressed a need for technology assistance throughout the senior community of Mar Vista. Residents filled out a survey indicating the dates and times they would be available and which apps or programs they would like the most help with. Windward student volunteers were from both the Middle and Upper School and offered their expertise to this project. Workshops were held Fridays on April 21, April 28, May 5, and May 12, in Room 210 after school. "I asked the students to think about the older adults in their own lives and how necessary it is to keep up with the changing means of communication in our society today. 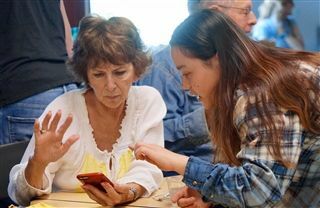 We talked about older adults who have retired and want to stay in contact digitally with their families, if they are far away, and we also talked about those who are still working and need to know these kinds of programs, as they may become relevant to their field," said Service Learning Coordinator Patrick Warfield. 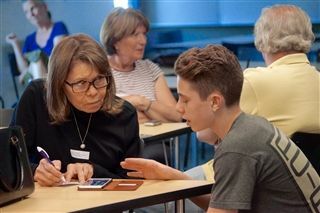 "I loved working with the seniors every Friday and helping them discover how their devices could improve their lives; it felt wonderful answering any questions they had about technological problems. 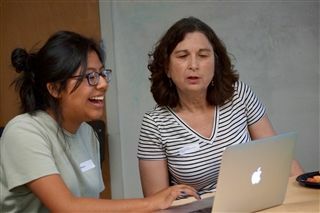 Not only was it great to use our tech knowledge for good, but it was also an amazing experience to talk to people who have could impart their wisdom on us younger generation," said Meresa Garcia '19. "Sheri Akers (Aging In Place Committee Leader) was an integral part of the whole process and really helped us to develop the program and start a pilot program this year. We are looking forward to expanding the program next fall," said Assistant Director of Operations Jacqueline Varney.